A Planning Design Study By James A. Anderson, M.A. (Hons), Dip. Ed. The central area of Hamilton has three assets as regards open space, each of which has great potential for recreational development and improving the aesthetic character of the city. These are the riverbank known as ‘Hamilton Parade’, the Town Belt, and Garden Place. p8. The Town Belt is also a priceless asset, and its ‘erosion’ by uses other than open space or recreation is to be regretted. The future use of this belt needs careful planning if what remains of it is to continue to serve the people of the city as the founders intended when it was set aside in 1879.
p12. (9) Figure 7 shows that much of the Town Belt has been eroded for purposes other than recreation, or is leased to sporting organisations which effectively exclude the general public from their areas except when competitive events take place. Little land is therefore left for casual use by the public. A close examination of future policies towards the use of this Town Belt land is needed. p27. The Town Belt has been seriously depleted since 1879 when it was laid out (see Figure 7). A large part of the southern area has been subdivided for residences, two schools have located on it, the City Council has taken one section for a workshop and depot and another, by the river, for a water treatment plant, now obsolete, and large areas have been leased to sports organisations, thereby effectively denying access to the public for much of the time. Seddon Park, the city’s major cricket ground, Rugby Park, the premier rugby ground, the Hamilton Squash Club’s premises and a tennis club are the main areas concerned here. These areas are fenced off and although theoretically the public can use them, in practice they are excluded except for the times when matches are played. Thus, Hinemoa Park, the Lake, and small patches elsewhere are the only areas of open space remaining for passive use or visual relief. p28. The Town Belt must be consolidated to serve its function as an ‘edge’ to the inner city, providing ‘visual relief’ from built-up areas on either side. In order to create the sense of a ‘core’ to the city, high rise development within the central city should be confined to a relatively small area. (v) No further Town Belt land should be allocated to clubs with restricted membership, particularly if it involves the erection of buildings. Is New Zealand’s housing crisis about lack of entry-level housing? Are parts of Hamilton’s Operative District Plan (ODP) about political distaste for entry-level housing? This post looks at rules 4.4.12 (page 27) and 4.6.4 (page 36). What we do not want is living conditions worse than prison conditions. Here, NZ Treasury and Corrections reviewed Spring Hill and other prison facilities. ‘A single Cell single 7.6m2 to 8.6m2 and a double 10.6m2 – 14.7m2’ (page 18). The double is close to torture, based on the European reference (6+4+1=11m2). But there is a bit more to prisons than just cells. It is important to note that “the recidivism rate is believed to be related to the success of the programmes that are implemented. It is the needs of these programmes that will determine the requirements for space and facilities in the prison design”. Page 18 of the link gives supporting measurements. The photo below is not prison accommodation; it is an illustration of ‘Space Box studio units’. Hundreds of them are being used around The Netherlands. “The Space Box is equipped to operate as a compact house in its entirety…[it] consists of kitchen, shower and bathroom, all equipped in an area of ​​18 m2 or 22 m2”. So what justifies Hamilton’s 35m2 minimum studio size? 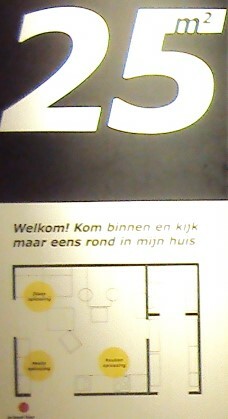 IKEA also offers 22m2 and 25m2 Studio examples. But back to Holland, where Delft University of Technology (ref 1) designed low-income housing for the South African government’s ‘Reconstruction and Development Programme’ (RDP). This is a 30m2 one-bedroom unit and below IKEA offers a 35m2 version. So what justifies Hamilton’s 45m2 minimum one bedroom size? The New Zealand Initiative report: ‘Priced Out’ gives an example of what happens when there is an over-supply of entry-level dwellings (Page18) (my emphasis). The ODP rule on minimum floor area was not in Hamilton’s last-century Town Planning rule books; it has nothing to do with the RMA. Is it about politicians’ desires for other people to think like they do? The problem is that New Zealand does have a housing crisis because of an undersupply of entry-level housing. The outcome of limiting the supply of entry-level dwellings is that the entry-level dwellings become like prisons, where you have no choices.